R7-A7 Key Chain is a Star Wars: The Clone Wars key chain set released in 2009. 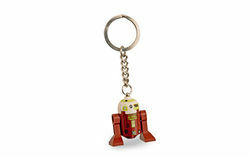 It includes an R7-A7 astromech minifigure attached by the dome to a key chain. Despite the fact that the dome and the body of the R7-A7 droid cannot be separated, the legs can be removed. Facts about "852548 R7-A7 Key Chain"